More positively, Brian O’Driscoll and Fergus McFadden are due back in training on Thursday. Kearney is helped off the RDS pitch last Saturday. LEINSTER WING DAVE Kearney has been ruled out of action for the next “four or five months” after tearing his anterior cruciate ligament in last weekend’s RaboDirect Pro12 semi-final against Ulster. The 24-year-old was absent from the Ireland squad named by Joe Schmidt on Monday, leading to strong suspicions of a serious injury. The confirmed torn ACL is a disappointing end to what has been an excellent season for the Louth man. Kearney made his Ireland debut last November, scoring two tries against Samoa in Dublin. A second cap in the infamous narrow defeat to New Zealand followed, before the elusive wide man started all five of Ireland’s games in the victorious 2014 Six Nations campaign. With surgery on the knee to follow in “the next week or so,” according to Leinster, Kearney will be working hard over the summer months in an attempt to return to action as soon as possible. There was positive news for the province on the injury front alongside the announcement of Kearney’s injury, with Brian O’Driscoll and Fergus McFadden expected back in training on Thursday after being replaced against Ulster following heavy knocks. Mike McCarthy is making “good progress” with his calf problem and has trained this week, while scrum-half Isaac Boss is on the comeback trail from a similar injury. Email “Leinster's Kearney out for up to five months after cruciate ligament tear”. 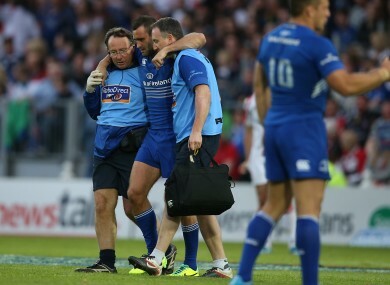 Feedback on “Leinster's Kearney out for up to five months after cruciate ligament tear”.